Motorola recently rolled out Android 3.0.1 update for the XOOM tablet, which will bring the support for Adobe Flash 10.1. The new firmware comes with some fixes and improvements, along with the Adobe Flash 10.2 support and the daylight savings time issues. Sadly, this update won’t be available for unlocked and rooted XOOM tablets. To get this update on rooted Motorola XOOM, you will need to roll back the device to stock and relocked it. 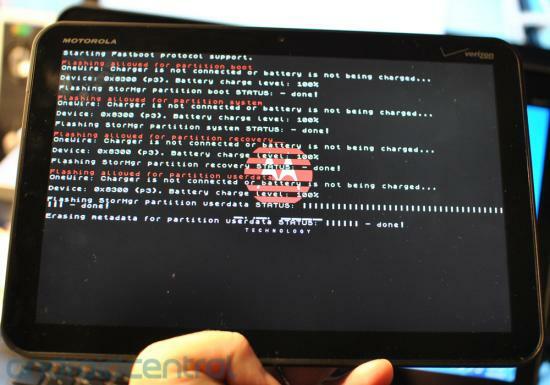 Follow the complete steps given below to unroot and re-lock the Motorola XOOM. You’re going to need to have the Android SDK installed. You can download it here. To relock the device, type fastboot oem lock and wait for the menu. Now press the volume-down button and then press the volume up button. After completing these steps, reboot the device. Your Motorola XOOM tablet will be back to stock. Now you will be able to receive the Android 3.0.1 update as well as all future updates from Motorola.